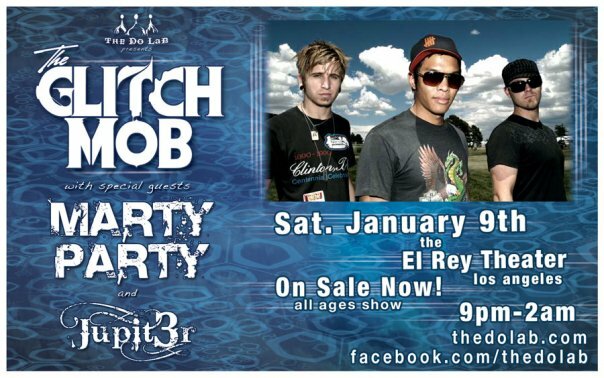 This entry was posted on January 4, 2010 at 11:30 AM and is filed under Events with tags el rey theater, el rey theatre, Glitch Mob, jupit3r, jupiter, los angeles, marty party, martyparty, the do lab. You can follow any responses to this entry through the RSS 2.0 feed. You can leave a response, or trackback from your own site. Shilo, your blog is the best! We’re not just saying that because of this post above… every post you put up is so well written, and even we love learning about new music all the time because of you!! Much respect! See you on the dancefloor this weekend! Shilo.. thanks for keeping us informed in all whomptronica news, with your words written from your soul.